Barney McKinney Giles was born on 13 September 1892 on a farm near Mineola, TX, to Richard Portlock and Louisa Read Giles. He and his identical twin, Benjamin Franklin Giles, both attended East Texas Normal College and taught school for three years. Both twins studied law at the University of Texas until World War I began in Europe. Benjamin Giles went to Canada to see about joining the Royal Flying Corps, and then America became directly involved, allowing both brothers to join the U.S. Army Air Service. Benjamin was an officer candidate and became a Second Lieutenant in April 1917. Barney entered as a flying cadet in August 1917 and was commissioned as a Second Lieutenant in April 1918. Barney then flew with the 168th Observation Squadron in France for a year. Barney Giles resigned his commission in September 1919, Benjamin resigned in October. The Giles twins returned to duty one year later: Benjamin in March 1920 and Barney in October 1920. Barney served as Assistant Engineering Officer, first at the Aviation Repair Depot in Dallas, TX, and eight months later at San Antonio Air Intermediate Depot. He became a First Lieutenant in April 1921, and remained at San Antonio until July 1924, when he transferred to Kelly Field as Engineer and Operations Officer. Giles served as Assistant Chief at the Maintenance Branch in Fairfield, OH, from July 1925 until April 1927, and then as Chief of the Maintenance Engineering Branch, Field Service Station at Wright Field from May 1927 until April 1928. Giles spent the next year as Assistant Engineering Officer and Instructor in the Flying Department at March Field, CA, and in July 1929 became the Post Engineering Officer at March. He served as Chief Engineering Officer at Rockwell Air Depot in San Diego from October 1930 until July 1934, becoming a Captain in January 1932. Giles attended the Air Corps Tactical School at Maxwell Field, AL, with his twin brother. The two Giles men graduated in June 1935 and both advanced to the rank of Major. Other officers in the graduating class included strategic bombing advocates Haywood S. Hansell, Muir S. Fairchild, Laurence S. Kuter and Hoyt S. Vandenberg. Major Barney Giles commanded the 20th Bomb Squadron at Langley Field, VA, for a year and moved up to Operations Officer of the 2d Bomb Group there in July 1936. He flew the first YB-17 Flying Fortress service test bomber to Langley on 4 March 1937. He was awarded the Distinguished Flying Cross for leading the rescue of seven men stranded on an ice floe near Cape Cod Bay. After graduation from the Command and General Staff School at Fort Leavenworth, KS, in June 1938, he went to Washington, DC, as Chief of the Inspection Division in the Office of the Chief of Air Corps. Barney Giles was promoted to Lieutenant Colonel in February 1941, to Colonel in January 1942, and to Brigadier General in March. In July, Giles went to Hamilton Field, just north of San Francisco, where he organized and commanded the 4th Air Service Area Command. 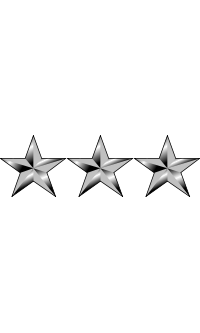 Giles received the second star of a Major General in September 1942. He was named Director of Military Requirements and Assistant Chief of Air Staff for Operations in March 1943 and Chief of Air Staff in July. Giles was promoted to Lieutenant General in May 1943 and in July was named Deputy Commander of the Army Air Forces. In this role, he often served as acting head of Army Air Forces because of General Arnold's prolonged illness. Giles actively promoted the development of long-range capabilities for fighter aircraft such as P-38 Lightnings, P-47 Thunderbolts and P-51 Mustangs. He went to the China-Burma-India Theater in mid-July and held a conference with commanders to arrive at some agreement on the allocation of tonnage over The Hump. Giles was named Commanding General of the Army Air Forces in the Pacific Ocean Area in April 1945 and was in charge of planning the final B-29 Superfortress air attacks against Japan, including plans for dropping the atomic bombs. At the death of President Franklin D. Roosevelt, Giles and other top military leaders briefed Harry S. Truman in the Oval Office the first morning of his presidency. In May, Giles went to Guam to join Major General Curtis LeMay in planning the strategy of bombing industrial and petroleum targets in Japan. Giles stated to the press that Japan's 148,000 square miles would receive more bombs than Germany's 215,000 square miles. In June, Giles backed Admiral Charles A. Lockwood's plan to hold airman-submariner conferences with the goal of improving air-sea rescue operations. Giles was appointed Deputy Commander of U.S. Strategic Air Forces in the Pacific under General Carl Andrew Spaatz on 5 July 1945. 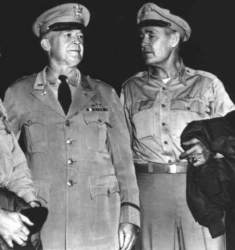 Giles witnessed Japan's surrender aboard the battleship USS Missouri. In September 1945, Giles, LeMay and Brigadier General Emmett O'Donnell, Jr. piloted three B-29s in a record-breaking non-stop flight from Japan over Alaska and Canada to Chicago, a flight of 5,839 miles, then on to Washington DC. At that date, it was the longest non-stop Army Air Forces flight; it was the first non-stop flight from Japan to the U.S.; and the bomb bay filled with fuel was the heaviest load ever lifted by a B-29. In October, Giles became Commanding General of the U.S. Strategic Air Forces in the Pacific; he held this position until his retirement on 30 June 1946. Giles's twin brother, Benjamin, also served at a high level in the Army Air Forces and retired from the military in September 1946 at the rank of Major General. Giles earned a Doctorate degree in Aeronautical Engineering from Pennsylvania Military College. After retiring from the military, Giles served as Vice President of Air Associates, Inc. in New York for three years. Subsequently, he worked for ten years with Swiss American Aviation Corporation, later known as LearJet, helping to develop the automatic pilot and other instrumentation. Giles was a member of the Order of Daedalians. Barney Giles married Hollyce Thomas (1896-1968) in San Antonio, TX, on 18 April 1922; the 46-year marriage produced no children. After her death in 1968, he married Laura Edwards in 1969. Laura Edwards Giles died in the early 1970s, and Barney Giles married Katherine Elizabeth Gregg, on 11 October 1975. Giles's twin brother Benjamin died in 1974. Lieutenant General Barney McKinney Giles died of complications of pneumonia on 6 May 1984 in San Antonio. Both he and his twin brother are buried in Section B at Fort Sam Houston National Cemetery in San Antonio, TX. Gen. Giles (R) pictured along side of Gen. Henry Arnold.